Although it may seem that this blog has been forgotten or the author disappeared, I wanted to let you know that I am still here! The appropriate expression for my life right now is “When it rains, it pours”. Not only was I already busy with full-time interpreting, translation, my NYU class; now I am adding an imminent move on top of that. We signed a couple of weeks ago on a beautiful home rental at Keowee Key, and we are moving in about a week! So I have been busy transferring utilities, phones, internet, mail, all the essentials… This week-end I have got to tackle the most daunting task: PACKING (wish me luck)!! I hope you don’t think I am “cinglée”, this is not a permanent state. It is somewhat healthy. Healthier would be to kick a dummy, lift some weights or rollerblade. It is on my to-do list for after the move. // Péter un câble/ un plomb/ les plombs // expression: to blow a fuse, to go crazy, to get (very) angry, to lose control, to go postal; syn. : péter une durite, péter un fusible, avoir les fils qui se touchent, disjoncter, perdre ses moyens, perdre la tête, perdre les pédales, piquer une crise, etc. The above etymology reminds me of what I felt last night when I watched the show NOVA, titled “Why ships sink”. It drew a parallel between the Titanic and the Costa Concordia, showing exactly how the iceberg or rock tore the underwater portion of the hull, like a sardine can! It also explained that some ships nowadays have underwater pumps, at the very bottom of ships, to collect seawater or eject liquids. They showed a 1996 accident that happened because one of those pumps broke and the water filled one compartment, then the next, then the full piping system for the ship. It sank within 1 hour! And you know why that stressed me out? Because we are going on a Mediterranean cruise with my family in May/ June (MSC Croisières), and although I know being on a cruise is statistically much safer than driving or flying, I shiver to think about actually having to implement the evacuation drill, when the onboard staff is incapable of helping you. I am going to meet the captain in person, and I want to have an idea of what the guy is made of. Will he run away like former Captain Schettino, or will he be on the microphone directing staff, reassuring passengers, calling for help and doing everything he can to save everyone, at the expense of his own life if must be? 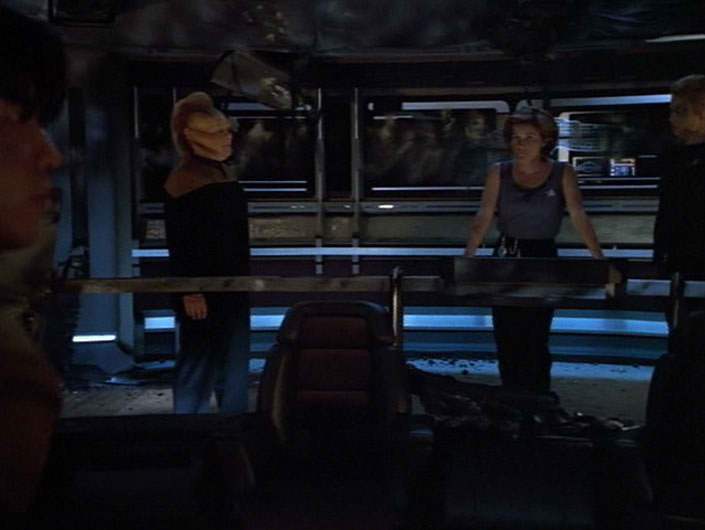 Captain Janeway doing everything in her power to save the crew and her ship. I don’t know if I can tell what kind of man the captain is with a hand-shake (heck, I don’t even know what I would do in an emergency situation! ), but I know I want a Captain Picard, Captain Janeway or Captain Sisko type… Yep, in Star Trek, the captain goes down with the ship! Nice to see you back, and good luck for the move! Thanks for clarifying what péter un câble means and for reminding me that câble is masculine. I’ll try to use it sometime. Hey, maybe this Sunday night, some people in France are going to péter un câble! Thanks for stopping by Catherine, so true! I have been completely oblivious to most recent news leading up to the elections… but then, it is just politics. People can go nuts over it if they want, makes the news more interesting 😉 Have fun being right in the middle of it in Paris! I read your blog posting as soon as I opened my eyes this morning! I had been missing it. Lots of good luck with the moving. How neat, nice wake-up call with an « exploding » word 😉 Thanks for the encouragement Jonathan!! You are so funny Nadia. But why on earth do you watch a show about sinking ships when you will be on one of those in a few weeks. I guess it’s part of what “péter un câble” means: do all the crazy things you are not supposed to do. Anyway, have a safe and relaxing trip! Bref, après un week-end épuisant, j’espère finir mon devoir et me remettre au cours pour les 3 jours qu’im me reste! Bonne semaine!